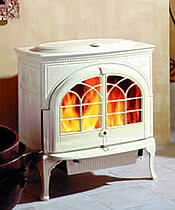 Jøtul F600 Firelight CB wood stove $4,000 (WOW! Heating bill eliminated! 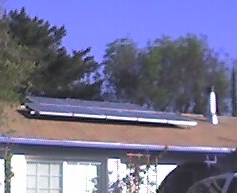 About $100/mo savings for the 4 or so months that heating is needed at night. Maybe $40/month overall) The interesting thing is that in my area (SoCal) people don't know what to do with trees that they have to cut down or trim; I get free wood all the time just by keeping my eyes open and offering to remove the logs. Particulates: What about the smoke? Well, it smokes a little when we start the fire, but there is no visible smoke after that. Take a look at this picture: It was taken on a cold March morning and the stove is running full tilt. Can you see any smoke coming out of the chimney? You wouldn't know it was burning except that the heat waves distort the image of the tree behind it. Health risks: Wood heat does put out more particulates than most other forms of heat, but the difference is not as large as one might think; Yes, between 15 and 30 times more than natural gas, and 2 to 4 times more than oil but about the same as coal and electricity.^ In areas where cold, still air "inversions" cause the smoke to be retained close to the ground and build to a serious thickness, other forms of heat, such as NG or LG, should be used to prevent serious health risks.^ It is true that long term exposure to wood smoke is probably even more damaging than smoking cigarettes, but the risk has been overstated by some. The figures quoted for particulate rates are often taken from smoldering wood rather than a real burn, or from old stoves and do not represent modern EPA certified wood stoves like ours.^ And again, a steady wind makes a huge difference. Burn small and HOT: A lot of the blame for heavy smoke belongs with the operator: Stoves that are smoking are probably old and burning poorly cut, green ("unseasoned") or polluted woods. Modern, clean burning stoves with the right fuel have no visible emissions and fewer polluting emissions over all. We should also consider that particulate matter settles out of the air with rain and time; other pollutants such as acids and CO2, do not. Finally, forests which are not managed eventually burn out of control releasing far more smoke in the end. Fog: One last downside to wood heat is fog: The particulate mater can cause water droplets to form from humid air and create fog. If it gets heavy enough, it can be a hazard for driving and it keeps the sun off the crops! Processing. e.g. coal must be cleaned, crushed, sized and dried. Wood must be split and dried or "seasoned"
For every fuel, most of the steps above are about equally expensive, and require more or less the same energy. Except Wood. Coal Mines are a lot more expensive to run than logging operations, and clear cutting a forest (the worst way to do it) can really cause some damage, but it's nothing compared to a coal mine or oil spill. Wood can be cut locally almost everywhere in the USA (all of mine comes from right here in my own town) so Transportation is not an issue. Coal isn't too bad, but for NG you have to build a pipe and oils comes half way round the world. Processing wood is just splitting (good exercise) and drying (in neat single row piles). Lots of people who split wood might argue that it's less than totally easy, but it isn't anything compared to the others! Storage doesn't require anything more for wood. Coal has to be stored in safe facilities and Natural Gas needs big metal tanks! Distribution is another win for Wood since it typically doesn't need to go farther than from your pile to the stove. Actually, that might be the only area where Wood looses; Fossil fuels don't require that you go outside on a cold winter night! All in all, wood heat does a lot less damage to our world than anything else. http://www.aebiom.org/IMG/pdf/WOOD_FUELS_HANDBOOK_BTC_EN.pdf (cached 20150716) Truly amazing listing of facts / tests / data reguarding the use of wood to produce heat. http://www.woodheat.org "Burn sustainably harvested, properly processed and seasoned fuel in an advanced combustion stove or fireplace that is vented through a chimney that runs straight up through the building." http://burningissues.org The other veiw point. Presented here for completeness. Most of what they say is true, but all of it is exaggerate and applies to the worst case only.